The second season of Preacher ended last night with a slow burn of a finale punctuated by a few twists and turns. This has pretty much been the blueprint for this season, if not the entire series: long stretches of fizzle, followed by a few moments of sizzle. Given the show’s source material, I expected so much more—but it’s time to finally realize that’s not this show. It’s odd because season two started in a way that lived up to my wildest expectations for the adaptation of the throughly bonkers comic by Garth Ennis and Steve Dillon. Since the first season acted as a prequel to the comic book story, season two was supposed to shoot off like a rocket, with Jesse, Tulip, and Cassidy finally hitting the road on their mission to find God. The insane season premiere technically delivered on that promise, and the show became as pulpy and shocking as people had expected... and then the rocket ran out of fuel. The search for God sent Jesse, Tulip, and Cassidy to New Orleans, where the majority of season two took place. The show occasionally visited Hell and Europe, but for the most part, the New Orleans setting felt like handcuffs on the larger story. Honestly, I can only think of a handful of instances where Cassidy or Tulip even left Denis’ apartment. The season had its moments of insane genius—the stuff with Fiore at the casino, battles with the Saint of Killers, Herr Starr’s origin—but by last night’s finale, the story had only advanced a little over the course of its 13 episodes. Instead, it spent most of its time needlessly driving a wedge between the three main characters, when we all wanted was to see them together, on the road, having adventures. Now the third season looks like it’s going to have to waste more time for Jesse to repair his relationship with Cassidy and Tulip before they finally go off searching for God. 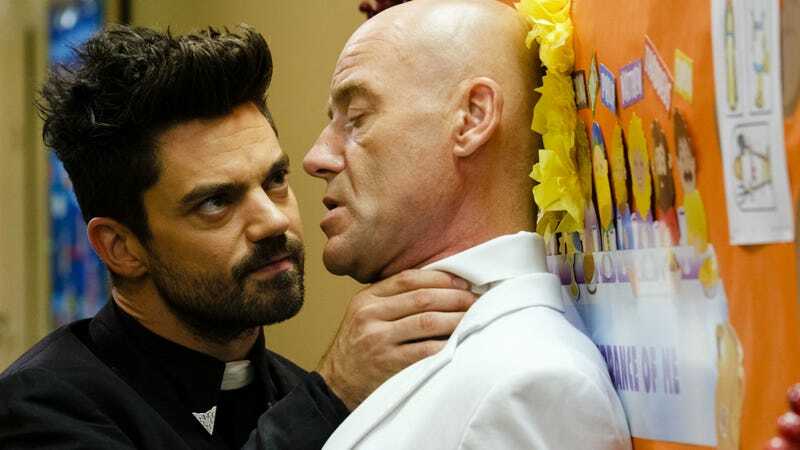 Preacher’s second season was still improvement on the first season, but it wasn’t the thrill ride I had been hoping for, and it’s time to admit the show’s not ever going to be. It’ll surely continue to have its occasional, incredible moments, but it’s going to take its sweet time to tell its story. It’s more methodical than it is exciting. It’s still entertaining, but it’s never going to be the crazy, balls-to-the-wall the show people were expecting when we heard Preacher was finally coming to TV. Now that I know this, it’s okay, and with my expectations curbed for season three, I’ll probably enjoy the show more than I have been. Just not as much as I wish I was.